The Kopis team believes that technology is entering the Age of Re-personalization, so we enjoy working with companies that are at the forefront of this emerging trend. One such company is The RAP Index, founded by Chip Felkel, an entrepreneur and activist with 30 years of experience in strategic communications. 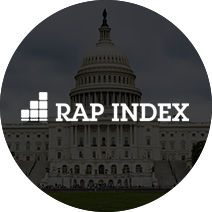 The RAP Index is a key contacts software service, developed by advocacy experts for advocacy professionals, that uses a patent-pending scoring process to decisively identify and measure the Relationships, Advocability and Political Capital of an organization’s stakeholders. Over the past few years, Kopis has worked with The RAP Index on a number of projects, from routine system maintenance and support to transitioning the system to a new, more reliable data source. Most recently, Kopis has worked with The RAP Index development team to build a new dashboard feature and launch an international pilot of the system. Brian Aufmuth, one of the lead project managers for the dashboard feature, agreed. With the client’s parameters in mind, Kopis got to work integrating with The RAP Index team and building the solution. After our initial conversation, Kopis again met with The RAP Index team to establish a process, discuss the project specs, determine the full scope of the project, and create a reasonable time and cost estimate. According to Brian, proactive communication is just one of the reasons that The RAP Index and Kopis partner together so well. The RAP Index launched the new dashboard feature earlier this year, and so far the results have been overwhelmingly positive.